If you collect old pennies, then you may already have a 1971 penny in your possession. These old Lincoln pennies in your pocket change may look ordinary, but all are worth more than face value, and some are worth much more than 1 cent! If you’re looking for current 1971 penny values, you’ve come to the right place. We’ll tell you what your 1971 pennies are worth and how to find the doubled die penny worth than $25. The 1971 penny is made from a composition consisting of 95% copper and 5% zinc. Because the value of the coin’s copper content exceeds 1 cent, all 1971 pennies are automatically worth more than face value and are therefore worth keeping. Generally speaking, any worn 1971 penny is worth 2 cents each. Most 1971 pennies are common. However, there is at least one rare 1971 penny. It’s the doubled die 1971 penny, and most are worth from $25 to more than $150! The 1971 doubled die penny is a scarce error variety. How do you know if you have a 1971 doubled die penny? Look for doubling on the obverse (head’s side) in the inscriptions LIBERTY and IN GOD WE TRUST. TIP: You’ll need a magnifying glass to really see this doubling very well. The 1971 doubled die penny isn’t nearly as popular as some other widely known error coins — such as the 1955 doubled die penny, 1969-S doubled die penny, or 1972 doubled die penny. Nevertheless, the 1971 doubled die penny is a valuable collectible. Perhaps less than 500 or so exist today, making it a truly scarce coin. How much is a 1971 doubled die penny worth? Values range from about $25 for a well-circulated specimen up to $100 with very minimal wear. Here’s some more good news: you can still find the 1971 doubled die penny in spare change if you look closely enough! There simply aren’t many folks who know about this scarce 1971 penny — especially those who are outside of coin collecting circles. You’d be surprised how many folks have spent a 1971 doubled die penny and never even knew it, because they didn’t know they had anything special to look for on 1971 pennies. What Are Your 1971 Pennies Worth? As mentioned above, all 1971 pennies are worth at least 2 cents each. 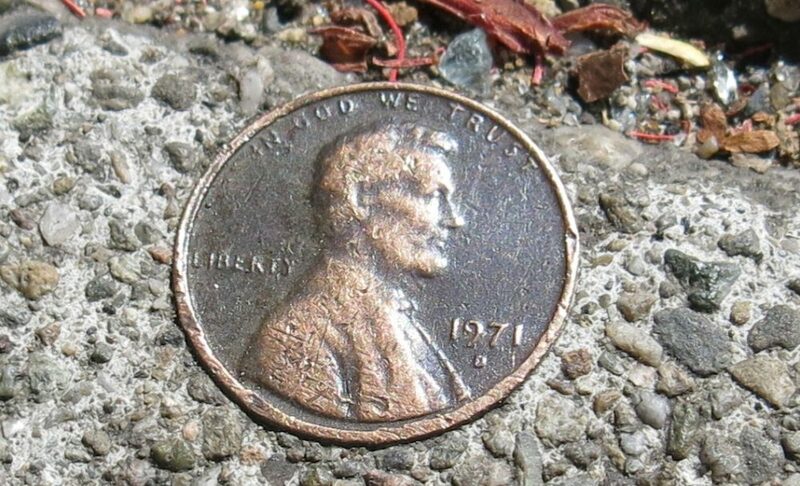 Let’s say you found your 1971 penny in pocket change — it’s worn, and thus worth 2 cents. But what about uncirculated and proof 1971 pennies? What are these old pennies worth? *Values are for problem-free coins (no cleanings, holes, porosity, etc.) in uncirculated condition or proof. Circulated pieces, including the regular 1971-S penny, are generally worth about 2 cents, with the exception of the 1971-S doubled die penny. What Else Happened When Your 1971 Penny Was Made? The voting age in the United States was lowered to 18 years of age with the passage of the 26th Amendment. Mount Etna, notoriously Europe’s largest volcano, erupted in Sicily. The invention of the microprocessor introduced the digital age. The United Kingdom and Ireland decimalized their currency, switching to a monetary system in which 100 pence equals 1 pound. Antiwar sentiment in the Vietnam era grew when the leaked release of the Pentagon Papers revealed several military actions in Vietnam that were never disclosed to the public. Walt Disney World opened near Orlando, Florida on October 1. At the time, the resort included only Magic Kingdom and a handful of hotels and other amenities. EPCOT Center, the next major park to be unveiled at Walt Disney World, would not open until more than a decade later. A new house cost $25,250, a car could be bought for $2,500, gas cost 40 cents per gallon, and a first-class postage stamp was 8 cents. Top songs included “You’ve Got A Friend” by James Taylor, “Maggie May” by Rod Stewart, “It’s Too Late” by Carole King, and “Never Can Say Goodbye” by The Jackson 5. All in the Family, The Flip Wilson Show, Gunsmoke, Mannix, Marcus Welby, M.D., The Partridge Family, and The Brady Bunch were among the top shows on TV. The most popular movies of 1971 included A Clockwork Orange, Dirty Harry, Willy Wonka & The Chocolate Factory, The French Connection, and Fiddler on the Roof. Which Old Pennies Are The Most Valuable?